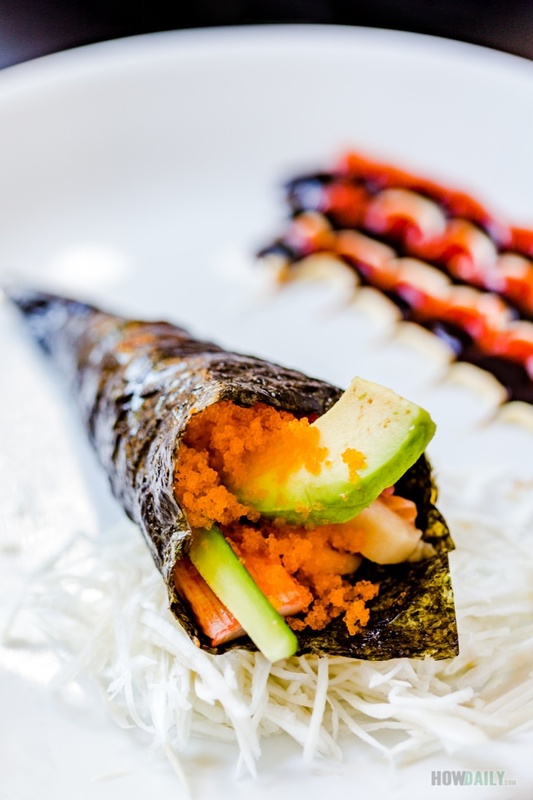 As you might already known, there are all kinds of sushi, among that is Temaki. 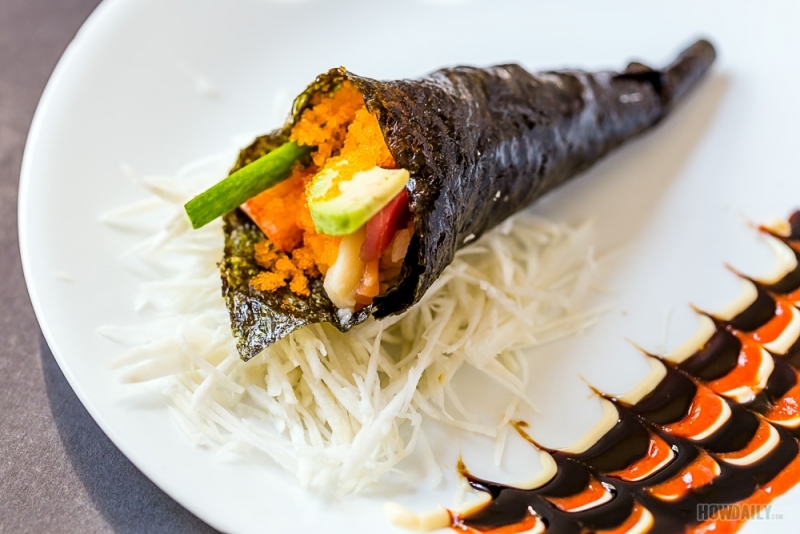 Temaki or Temakizushi is simply the cone shape – hand rolled version of the usual maki sushi that you have. The content inside is just as wild as any regular sushi roll. So today, after scouting through our local Japanese market and found some nice fresh sushi grade fish, this is the idea I come up with. I’d call it “A day on the beach“, not that I really want to go but couldn’t *cough*. For the sand, try to shred or grate a daikon radish or pickle ginger (the un-dyed one). Several sauces are included in the glazing to make resembling that of ocean wave: unagi, mayonnaise and sriracha. But you can used anything really, like dyeing the mayo into blue maybe?!? To make a temaki, it’s fairly easy. Simply spread the rice, arrange ingredient and roll it up into cones. Even your kiddo can do it. In fact, I would suggest to prepare all the ingredients, then have a rolling session as your group enjoying them. The reason is that nori taste the best while being crispy, and it tend to absorb moisture in rice/topping if left too long. Afterward, just rest your temaki on your decorated plate if you roll them all and serve to others. To eat temaki, first make sure your hands are clean, as temaki will only be consume by hands, any other method would be resulting in a crumbly mess. Now as you roll a temaki or was given one, eat it immediately. Pick up on the lower/small end, dip the opening with minimal amount of soy sauce and take a big bite. Feel contented and just repeat 2-3 more time to finish the temaki. 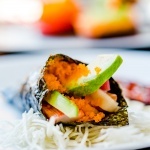 Beautifully decorative dish with a hand roll full of raw goodness. This tuna-salmon temakizushi is so easy to roll and prefer to many. Try them as appetizer or make extra batch to serve as main dish. Shred daikon to use as garnishing decoration, or you can use pickled ginger as well. Prepare the plate by glazing and decorating with the sauces for each portion. Cut your raw toppings (tuna, salmon, etc.) into 3" to 4 " length sticks. Cut along the longer side of mini cucumber and avocado to create thin long sticks. Fold each nori sheet in half, then tear into two. Place a piece of nori onto your hand or a flat surface. Drizzle on some sauce like kewpie or sriracha. Top with a spoon of tobiko. Now, just lift one corner (closer to you) and roll it in a triangular motion to create the cone shape. 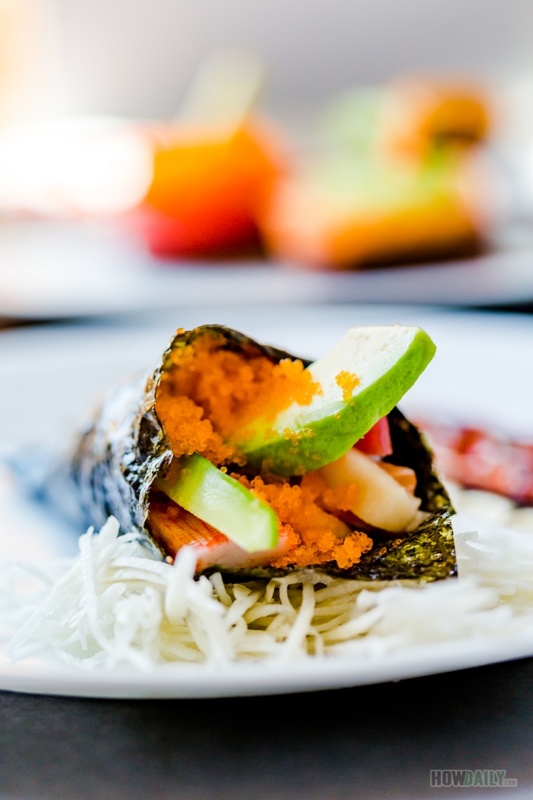 Place this finished temaki on top of the decorated dish and serve immediately while the nori still crispy.